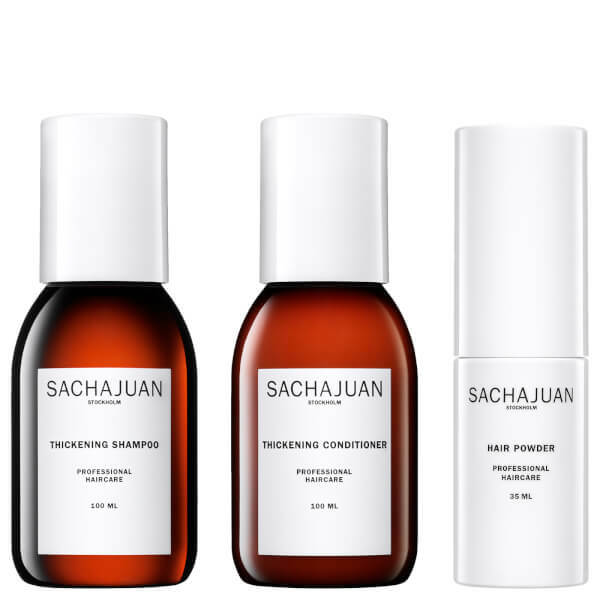 Ideal for fine and thinning hair types, Sachajuan's Beauty Bag Thickening Collection delivers long-lasting volume and texture for salon-worthy results. Achieve bigger, fuller locks with minimal effort. A luxurious formula designed to effectively cleanse hair, whilst promoting a lifted, volumised finish. Utilising Sachajuan’s signature Ocean Silk technology, the shampoo rebuilds, repairs and maximises tresses to deliver thicker and boosted hair with enviable shine. Defends against heat styling damage for healthy, voluptuous locks. Powered by the brand's innovative Ocean Silk technology, the mineral-rich formula detangles and smooths hair for improved manageability. Working to revive limp, lifeless locks, the conditioner effectively replenishes and hydrates hair, whilst promoting a lifted, volumised finish. Expect full-bodied tresses with salon-worthy shine. Dry and invisible, the weightless powder can be used to enhance volume and lift at the root, or for separation and structure in the lengths. Suitable for all hair types and colours, you can expect fuller, thicker locks with flexible movement and zero residue. Perfect for adding texture and definition to fine, flat locks. Conditioner: Massage into freshly cleansed hair. Leave for 2-3 minutes. Rinse. Powder: Apply to root area for volume and lift. For separation and structure apply in lengths. Shampoo: Aqua (Water) Sodium Laureth Sulfate Glycereth-2 Cocoate Cocamidopropyl Betaine Glycerin Peg-4 Rapeseedamide Hydrolyzed Rhodophycea Extract Parfum Sodium Chloride Sodium Benzoate Hydroxypropyl Guar Hydroxypropyltrimonium Chloride Citric Acid Trisodium Sulfosuccinate Vp/Dmapa Acrylates Copolymer Linalool Limonene Benzyl Salicylate Hexyl Cinnamal Alpha-Isomethyl Ionone Butylphenyl Methylpropional Benzalkonium Chloride Phenoxyethanol. Conditioner: Aqua (Water) Cetyl Alcohol Stearyl Alcohol Glyceryl Stearate Stearamidopropyl Dimethylamine Dicaprylyl Ether Hydrolyzed Rhodophycea Extract Lactic Acid Amodimethicone Phenoxyethanol Vp/Dmapa Acrylates Copolymer Parfum Polyacrylate-1 Crosspolymer Peg-40 Hydrogenated Castor Oil Ethylhexylglycerin Cetrimonium Chloride Trideceth-10 Linalool Limonene Benzyl Salicylate Hexyl Cinnamal Benzalkonium Chloride.